The herbicide glyphosate, sold under a variety of commercial names including Roundup ® and Vision ® , has long been viewed as an environmentally friendly herbicide. In the 1990s, however, after nearly 20 years of use, the first tests were conducted on the herbicide’s effects on amphibians in Australia. The researchers found that the herbicide was moderately toxic to Australian amphibians. The leading manufacturer of glyphosate-based herbicides, Monsanto, declared that the researchers were wrong. Nearly 10 years later, my research group began examining the effects of the herbicides on North American amphibians. Based on an extensive series of experiments, we demonstrated that glyphosate-based herbicides can be highly toxic to larval amphibians. Monsanto declared that we were also wrong. These experiments have formed the basis of a spirited debate between independent, academic researchers, and scientists that either work as consultants for Monsanto or have a vested interest in promoting the application of the herbicide to control undesirable plants in forests and agriculture. The debate also moved into unexpected arenas, including the use of glyphosate-based herbicides in the Colombian drug war in South America where a version of Roundup is being used to kill illegal coca plantations. In 2008, the US EPA completed a risk assessment for the effects of glyphosate-based herbicides on the endangered California red-legged frog (Rana aurora draytonii) and concluded that it could adversely affect the long-term persistence of the species. More recent data from Colombia have confirmed that the herbicides not only pose a risk to tadpoles in shallow wetlands, but that typical applications rates also can kill up to 30% of adult frogs. 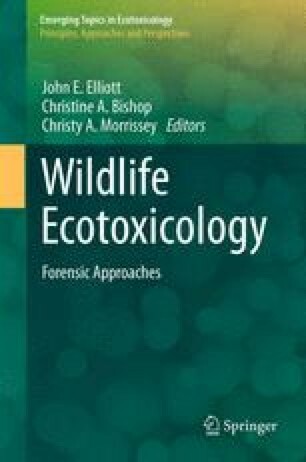 As one reflects over the past decade, it becomes clear that our understanding of the possible effects of glyphosate-based herbicides on amphibians has moved from a position of knowing very little and assuming no harm to a position of more precise understanding of which concentrations and conditions pose a serious risk. This chapter was improved by the comments of Christine Bishop, Will Brogan, Rickey Cothran, Maya Groner, John Hammond, Jason Hoverman, Jessica Hua, Heather Shaffery, Aaron Stoler, and several anonymous reviewers. I also thank the National Science Foundation for their continued support of my research. For the record, I have never accepted any funding from antipesticide groups.